Members of the Old Town Arts & Crafts Guild at the opening exhibition of their 70th season in March. If you spend much of your time on the North Fork’s Main Road hurrying from one appointment to another, you might easily miss spotting the North Fork’s oldest art gallery, tucked neatly in a red house alongside the traffic light in downtown Cutchogue. 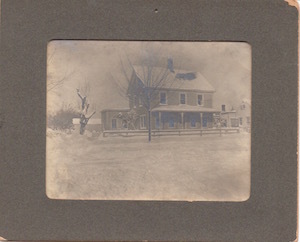 The Guild’s original location, across the Main Road from its current location in downtown Cutchogue. 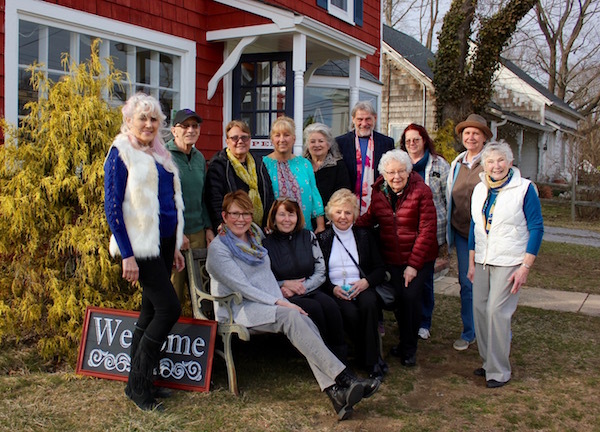 The Old Town Arts & Crafts Guild, an all-volunteer organization devoted to providing an outlet for local artists and artisans, is celebrating its 70th Anniversary this year, a testament to the torch being carried for an arts community that spans generations on the North Fork. The festivities kick off on May 6, with a special dinner commemorating the anniversary at Touch of Venice Restaurant. “It’s a labor of love. We’re all volunteers,” said Bob Kuhne, who has served as the Guild’s president for 18 years, in an interview with The Beacon in late March. 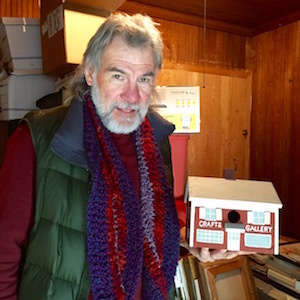 The original artists and craftspeople who founded the Old Town Arts & Crafts Guild first got together in 1948, said Mr. Kuhne, not long after the closure of two important North Fork Galleries in the early 20th Century — the Little Gallery in Southold and the Greenport Art Studio. Original members included Bessie North, Alma Cummings, Florence Kramer, Ruth MacNish, Agnes Mothersele, Mike White and William L. Hagen. The group held its first exhibition, with 86 artists participating, at Belmont Hall in Southold, which stood across from the Southold Pharmacy, but was torn down in the mid-1950s. Bob Kuhne, the President of the Guild for the past 18 years, has worked to amass a collection of historical North Fork works of art, which the Guild is hoping to display when it completes renovating the second story of their Main Road building. “It is the earnest hope of the Guild that at some time in the future they will be able to have a permanent home in which they will be able to have lectures, demonstrations and special exhibits during the course of the year which will promote interest and active participation in various arts and crafts and foster closer fellowship among artists and craftsmen,” wrote Guild committee members in a message to prospective members in 1950. In 1951, the Guild leased the old Beebe house, just east of the North Fork Bank building on the corner of New Suffolk Road, but, unable to buy that building and helped by an anonymous angel investor, the group took title to its current headquarters, just across the street, in 1953, said Mr. Kuhne. The Guild was extremely active in the 1950s, promoting the work of artists who later became known, through the work of gallerist Terry Wallace, as the “Peconic Bay Impressionists,” and holding an annual “Snow-Fence” sale in late summer. 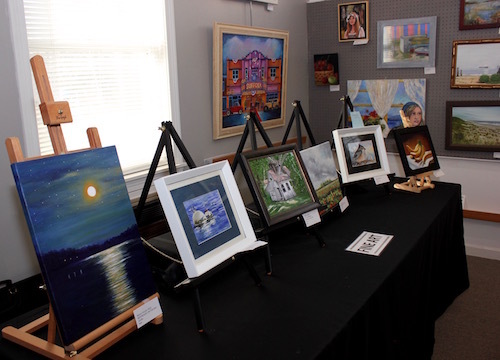 According to former Southold Historical Society Executive Director Geoffrey Fleming and Sara Evans’ book “A Shared Aesthetic: Artists of Long Island’s North Fork,” the Guild began exhibiting the work of high school students in the 1960s, through the initiative of painter Marjorie Tuthill. At this season’s opening juried exhibition. 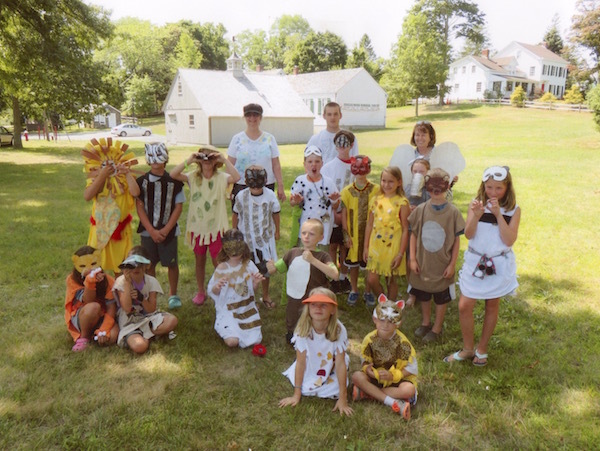 The Guild’s focus on helping young artists continues to this day, with initiatives including children’s art classes, a spring children’s art show later this month, and an August Young Artist Contest & Show. Guild member Ginger Mahoney has been instrumental in cross-pollinating the arts and environmental sciences at the Guild, helping to organize a talk two years ago by young artist Olivia Bouler, author of “Olivia’s Birds: Saving the Gulf,” who donated the proceeds from bird drawings she did to the National Audubon Society to help restore the Gulf of Mexico after the Deepwater Horizon oil spill. 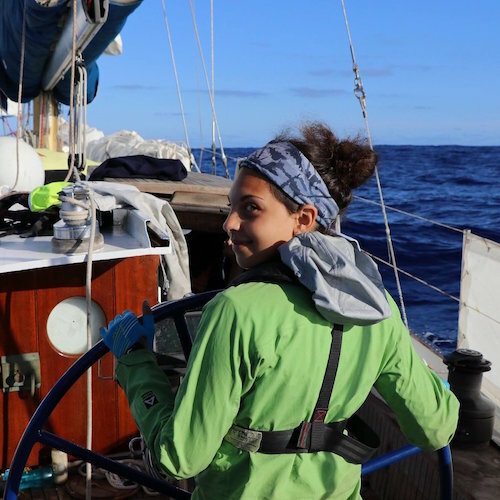 This month, on April 21 from 2 to 4 p.m., the Guild continues such collaborative programming, with a lecture and art workshop by Erica Cirino, a Stony Brook University graduate who has been traveling around the world photographing, making art and lecturing about plastic in the oceans. The workshop will be held in conjunction with the Children’s Art Exhibit, which will be shown the weekends of April 14 & 15 and April 21 & 22. Housed on a small lot, with minimal parking and the ongoing disturbance of a three-rail split-rail fence separating it from the large parking lot next door, the Guild holds many art and antique shows at off-site locations, including at Southold Town’s Peconic Recreation Center, at the Southold and Mattituck Historical Societies, and, most famously, on the Cutchogue Village Green, where this year’s big show will be held on August 4 from 9 a.m. to 4 p.m.
That show also includes a popular kids’ feature, the annual Green Project Runway, in which kids who participate in the Guild’s summer art program make their own clothes using upcycled materials. At a recent Green Project Runway session on the Cutchogue Village Green. The Green Project Runway is organized by Guild member Gayle Wagner, who has also served as the Guild’s de facto grant writer. As a volunteer-run organization, the Guild faces several challenges in an era when many other local arts non-profits have gone professional, said Mr. Kuhne. Board members of non-profits are required by law to not be compensated for their work, but with neither desire nor funding to hire professional staff, the board is the unpaid engine that drives this organization. Mr. Kuhne said he had been a member of the Guild for a scant couple of years before he was tapped to become the president. The former owner, with his wife Ginny Harms, of an antique shop called “Needful Things” on the Main Road in Southold, he brought prior experience with the business of selling art to his role at the Guild. Initially, he said, he heard many people aren’t aware that the Guild’s headquarters is actually a store, and hadn’t bothered to come in because they thought the building belonged to a secret society. 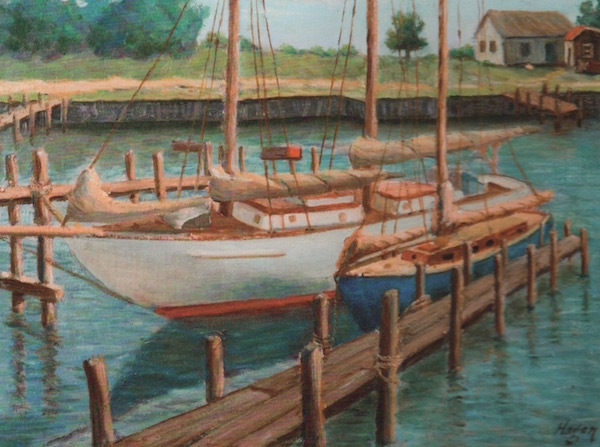 “Harbor Scene, New Suffolk, LI,” an oil painting by one of the Guild’s founders, William L. Hagen, is now in the collection of the Southold Historical Society. But after a few years of popping up some EZ Up tents on the front lawn and selling art on weekends, word is starting to get out that the Guild has no intent of being a secret organization. Guild members, who sell their work in the gallery and at numerous off-site shows throughout the year, pay $200 per year in dues, $100 of which is refunded if they keep a commitment to 10 days of service helping to run the shop each year. That support group will be getting together to celebrate on May 6, beginning with an opening of the 70th Anniversary Show at 1 p.m., followed by the celebration at Touch of Venice at 2 p.m.
Tickets to the party at Touch of Venice are $50 and include a full buffet and door prizes. There will be a cash bar. Tickets must be purchased in advance, with checks mailed to Old Town Arts & Crafts Guild, P.O. Box 392, Cutchogue, NY 11935 by April 28. For more information, email oldtownguild@aol.com or call 631.734.6382. More information is online at oldtownartsguild.org.